In Juanjo Cerrajeros Alicante we can give solution to all the situations that can arise with the garage doors remote opening of your community or house. We have been installing automatic door opening systems for more than 20 years, working with the latest technologies for non copyable remote controls with personalized encodings, changing codes and other leading technologies. The standard of Juanjo Cerrajeros Alicante has always been to make quality installations with expert staff. We work with highly qualified mechanics in electronics and electricity that together with leading European suppliers, allow us to prepare high quality and durable installations, from individual garages to high capacity installations. We have garaje doors remote controls that are non copyable today and in the future. Electronics is a technology with many advantages, such as price, the possibility of delete lost or stolen remote controls, and so on. But also has the disadvantage that many people and companies work on their copying, since the cost of doing so is relatively low, especially in working hours, and the profitability is really high. In Juanjo Cerrajeros we usually make nowadays non copyable installations with the existing copy controls, with CLEMSA brand in Alicante, company that we are official distributors, but we also have the possibility to put at your service the unique system of installation that is really incopiable today and in the future. If your garage or business, because of its special security features need this system, contact Juanjo Cerrajeros Alicante. In this system the codifications are given exclusively by us or by the administrator of the installation remotely and with an encryption that makes its copying impossible, thus ensuring the integrity of the system. We can also offer you a very interesting technology that we are starting to implement in Alicante, that consists on the installation of some modules of special GSM technology with which we can open the garage doors with the mobile phone. We make an initial installation that has a cost, as well as adding each mobile phone to the list, but after that there is no cost cost than the maintenance of the SIM card. The GSM module receives the call and DO NOT NEED TO ANSWER IT, so we do not make a real call (the system doesn’t answer so there is no cost in the call) and the door opens, even if we are far away from it. It is very comfortable for huge places with guests and other applications as it is not necessary to be present to open the door to third parties. If we change the mobile phone it continues working as long as we keep the same number so the durability is greatly expanded, we eliminate the batteries and many other advantages. If you want to open your garage with the mobile phone call us and we will inform you professionally for a fast, satisfactory and economic installation. If your community has an outdated system of garage doors remote controls (the easiest to identify are quartz garage remote controls with manual coding by small switches) these garage remote controls are no longer valid after various modifications of the Government on radio frequencies which can be used for different uses. The old garage controls work, but new spare parts cannot be obtained for the receivers and the reparations are really expensice, in the few cases in which fixing it is possible. Although the system still works, it is impossible to known for how, so it is a risk to acquire new garage controls from these systems because if the receiver is damaged it will not be repairable and all the controls will be useless for this and new installations. Juanjo Cerrajeros Alicante can install a new receiver that works in parallel with the previous one, and with economical garage remote controls with leading technologies, and their old controls will continue to operate for the duration of the receiver, but the new remote controls acquired will be modern and durable. The sooner the decision to make this change the more you will benefit, as fewer neighbours will throw their money in garage remote controls that sooner or later will be out of use. Contact us as soon as possible, for very little money you can solve this problem forever. If your garage uses pin remote controls call us today. Do not waste more money. Copies of garage doors remote controls in Alicante. The remote controls break down and families prosper and grow so you may need to purchase garage remote controls in Alicante. 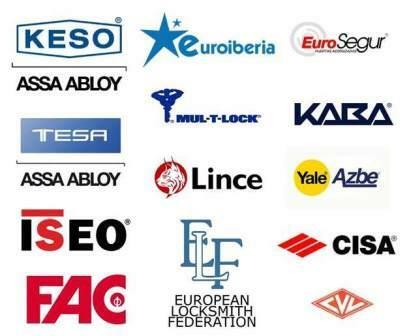 In Juanjo Cerrajeros we can make all the garage remote controls and magnetic keys that you need, either in original brand or with first class duplicators. We copy any garage remote control. We unified up to 4 remote controls in 1. We can even unify garage remote controls from different facilities into one with the consequent saving of money and improved comfort. If you need to copy your garage remote controls in Alicante contact us and you will instlantly take what you were looking for, without having to looking around. Garage doors in Alicante usually use different original remote controls and we are officinal distributors of most of them; Brands such as CLEMSA Alicante or REMOCON are very widespread and there are many installations of their remote controls in Alicante.